Golfer's elbow often presents itself in the form of tendinitis or the tendon actually tearing itself away from the bone. This most often occurs in the left, or lead elbow for right handed golfers. It is extremely painful and debilitating to the point that time off from the game or even surgery is required to correct the situation in many cases. The good news, it's completely preventable with RST golf swing mechanics. I'm going to use a recent golf student of mine as a case study. She had been instructed by her doctor to take a month off from golf as all of the physical therapy they were doing for her elbow were only helping the symptoms. Yet, every time she went out to practice and play golf, the symptoms worsened. The doctor told her that she either needed to address the cause of the issue or risk the tendon completely tearing from the bone. That's when she sought me out. Knowing that I built the RotarySwing golf mechanics around human anatomy for the sake of injury prevention, she felt it was worth the trip from Kansas to Colorado for a lesson to see if I could fix her golfer's elbow. It took all of 2 minutes for me to diagnose and completely cure her of the ailment. The most common swing fault I see in golf lessons where the golfer complains of left elbow pain is when they try and overuse the left side of the body for power. As you've likely read in my club head speed research article (click here) it is the right arm and right wrist that is responsible for producing the majority (as much as 60%) of the club head speed in the golf swing. If you're not using the right wrist correctly, you will try and make up for the lack of speed somewhere and that's exactly what she was doing. In the image above, observe the left picture first. This is what she looked like when we started (note that the arm band she had to wear to manage the pain of the elbow). In the left image, she had basically no setting of the right wrist. Because of this, she had to pull as hard as she could with the left arm and left side of the body. In this chain of movements, the left elbow was the vulnerable link and gave out first. 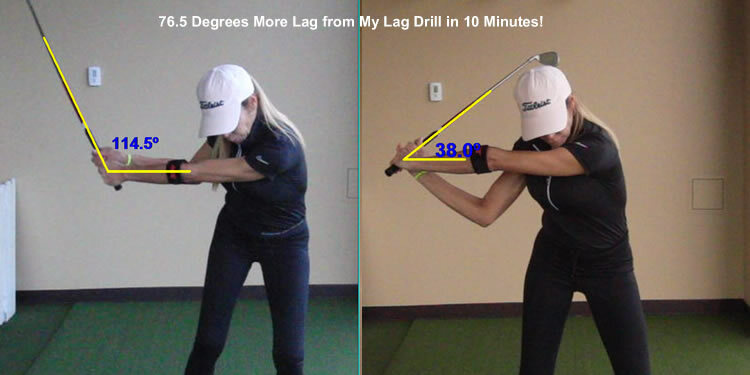 After a few minutes of teaching her to hit balls with her right arm and how to build lag in her golf swing, the results speak for themselves. This student loves to hit balls - for hours and hours - and couldn't anymore simply due to poor swing mechanics. One golf lesson was all it took to rid her completely of the pain in her elbow and she said that she "loved the feeling of her new swing" because it felt more athletic and effortless. If you're struggling with golfer's elbow, or any other golf swing related injury or pain, know this - with the RotarySwing mechanics THE GOLF SWING SHOULD NEVER CAUSE YOU ANY PAIN - EVER!!! 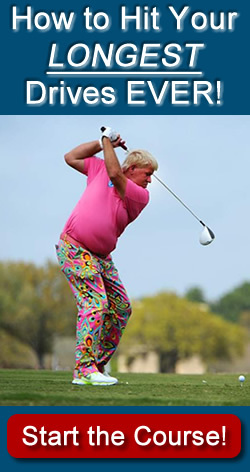 If you're tired of being in pain, join the tens of thousands of other golfers who have made the switch to RotarySwing Tour - take a look at some of our testimonials - maybe you'll be next! Click here for RotarySwing Tour reviews.